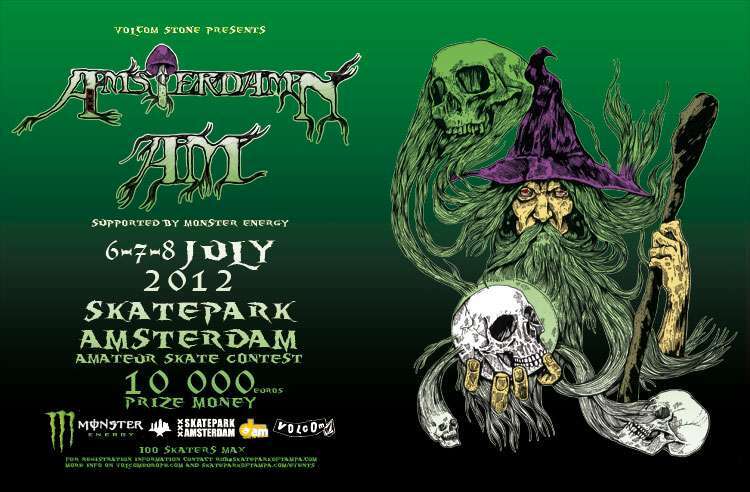 This weekend, Europe’s premiere amateur street skateboarding competition is at Skatepark Amsterdam (July 6, 7, and 8, 2012). On top of the amazing location and one of Europe’s best skate parks, an overall purse of 10,000 Euros is the icing on the cake for this super-fun contest. Top 12 finalists also receive a spot in Tampa Am. Don't miss anything! Watch updates everyday of the skaters profiles, videos, photos and contest results at http://www.volcomeurope.com/amsterdamnam. All contest information, registration, schedule, skaters is on the website. Fly to Schiphol Airport, Amsterdam (AMS). Take the train from the station inside to the airport to Centraal Station (about 15 minutes and 4 Euros). Once at thestation, exit the reardoors of the station and headtowards the water. Once you arrive at the onlystreet, go left and walk down to the blue ferryboats. Theboats are free and youwillwant to take the last boat on the left, next to the benches. Once arriving on the otherside, the skateparkis straight ahead and to the right, in the oldindustrial area (shipyard, NDSM building). Hotels in Amsterdam tend to beexpensive and hard to findat the last minute. If you are planning on coming, take a look at booking.com and get a leg up on reserving a room! Generally you will want to be in or around the Centraal Station. If not, beaware when you make the reservation and verify the location of the hotel. Otherwise itcould be a big surprise! KLM and Transavia are both Dutch airlines thatbhave many flights in and out per day to most countries. Brian Schaefer and Rob Meronek created the Damn Am series as they noticed that there was aneed to bring the Tampa-style Am contests to skateboarders outside of Tampa (Florida). If you can’t get into Tampa Am directly through your sponsor, entering a Damn Am is the only official way to qualify for the prestigious Tampa Am. Basically the “flavor” of the Tampa contests is taken to locations around the world. The first Damn Am started in 2001 at the Volcom Warehouse in Costa Mesa, California and has been going strong ever since. The success of that event led the inception of the Minnesota Damn Am, taking place every June in Minneapolis, which ran for nearly 10 years and moved to Atlanta in 2011. In 2006, Volcom decided to help take the Damn Am series over the pond and the AmsterDamn Am was born and has been etched into the schedule as a yearly event. The next move was to take one to Canada and finally in 2011 the first Damn Am China took place, rounding out four international stops. In addition to a damn fun time, the Damn Ams have assisted many amateurs with getting noticed on their way to professional careers. To say that most of today’s top pros have skated in a Damn Am Contest is not a stretch of the truth at all. In fact, with most of the industry watching at these events, it’s not difficult at all for a standout skater to pick up a new sponsor and gain some notoriety. Volcom Stone’s AmsterDamn Am today is one of the major European skateboard competitions with its level of skateboarding. It gathers the top European and US up-and-coming skaters into a three-day event of skating, friendship, and good times.